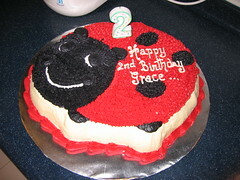 Today was Grace’s 2nd Birthday Party. 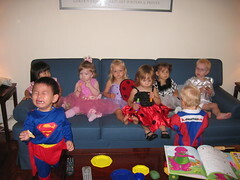 We had a small gathering over at our house and the kids came in their Halloween costumes. 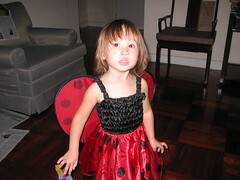 Grace was a Ladybug (or a Ladybird if you’re British) for the 2nd year in a row. Here are a couple of pics from today. Click the link below to see some more pictures of the celebration. 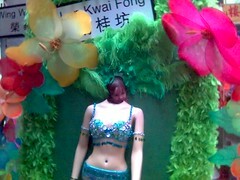 Today we went to the Lan Kwai Fong Carnival Streetfest. It was pretty cool. They had street dedicated to children’s games and toys. The rest of the festival was dedicated to the Hong Kong national pastime… drinking. Here’s some pics from today. If you ever wondered what Grace will look like in 20 years… here it is. My nephew, Alex, put together an Outakes/Blooper reel from the filming of the Tower of Tonkatsu movie. Click on the link below and you can see the kind of effort it takes in creating such a cinematic masterpiece. One thing I notice about Hong Kong is that there must be more Ferraris, Porsches, Lamborghinis, and Jaguars per capita then any other country in the world. Here’s a nice Ferrari just parked out on the street in Ap Lei Chau. On Saturday, we had the itch to get off of Hong Kong Island and go see something new. We ended up catching a boat over to Discovery Bay on Lantau Island. It was pretty nice there. 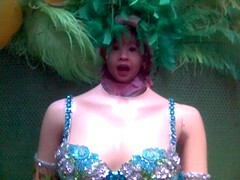 We had a nice lunch and found a party store where we bought a bunch of stuff for Grace’s 2nd birthday party coming up. 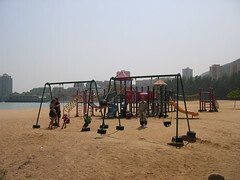 Here is a picture of a little playground we found on the beach in Disco Bay. The beach was deserted. I guess it is still too hot in October. 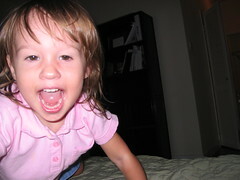 Since I posted a picture of Grace screaming (Almost Two! ), I thought it was only fair to post a picture of the happy young lady.